Comments: Antioch Baptist Church is located in Fluvanna County about 13 miles northeast of Scottsville near the intersection of Antioch Road and Rolling Road. 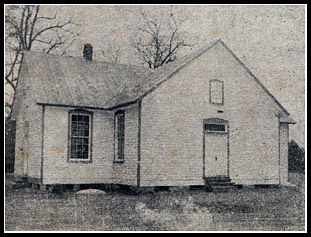 The church was organized in 1858 by 18 charter members, and five acres of land were deeded to the church trustees by John H. and Mary H. Burgess for a church site. Shortly after that donation, a church was built, and in 1901, the old church building gave way to the central part of the present church building shown above. The Antioch Baptist Church Cemetery adjoins the church. 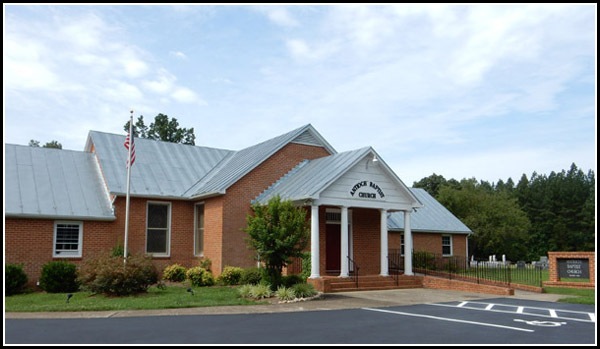 Directions from Scottsville Museum to Antioch Baptist Church, 4422 Antioch Road, Scottsville: Drive east on VA-6 for 8.5 miles and turn left onto South Street. Drive 0.8 mile and turn left onto Rolling Rd. South and then immediately bear right onto VA 620/Rolling Rd. S. in 3.5 miles the road name changes to Rolling Rd. South. In 0.3 mile keep right onto VA-620/Rolling Rd. South and take the first left onto Antioch Road. Antioch Baptist Church is one of the many old churches in this vicinity that played a strong and vital part in the lives of the families, who have made their homes near its grounds. Years ago, when settlers first came to build homes and establish families, one of the first things they did was to establish a place to worship. As communities spread out and sprang up too far from a church, another one closer was built. In an early Antioch Church book, we read: "Whereas R.A. Kent, John T.C. Scruggs, William I. Hughes, James Kent, Jesse R. Hughes, Joseph T.C. Jones, T.H. Wood, and others, determined after due and prayerful consideration, believing it likely to promote the glory of God, to receive by letter from several churches of which they have heretofore been members, and constitute a new church to be known as Antioch Baptist Church, in the County of Fluvanna, State of Virginia, did on the 15th day of November 1858, call Elders James Kent, V.T. Settle, and P.C. Hoge to sit as a Presbytery to consider and to decide as to the propriety of such a step. These, after an impartial examination of the facts and circumstances, decided to proceed with the organization, having first called Elder Kent to the chair, and appointed Elder Settle as secretary. Whereupon the presbytery proceeded to receive and number the applicants to extend the right hand of fellowship to all who were thus received, and then on motion to elect John T. Kent, Robert A. Kent, Jesse R. Hughes, Joseph C. Scruggs, W.I. Hughes, and T.C. Jones as Deacons, and N.E. Scruggs as Clerk of the Church. On November 15, 1858, John H. and Mary H. Burgess, husband and wife, deeded five acres of land to Church trustees John T. Kent, William H. Sadler, and W.I. Hughes. The deed states, "land on which there is now a Baptist Church." There is also a statement which tells us there sas a "schoolhouse on the southwest corner of said land." The first report made by the church to the Albemarle Association in 1859 states that the church had 46 members and 62 enrolled in the Sunday School, but there is no record of just how many of these were charter members. Nor do we know how many of these were colored members for many years. In 1872, there were two letters granted to colored persons and as late as 1891, one colored member is reported in the associational letter. Although no complete lists of the clerks of the church exist in those early years, we do know however, that Robert A. Kent was clerk in 1859. During 19=872 to 1878 (and possibly earlier) John P. Sadler served as clerk of the church. Then followed in order Robert Radzi Sadler, 1873 to 1879; John R. Omohundro, 1879 to 1883; W.J. Sadler, 1883-1890; A.E.T. Scruggs, 1890 to 1892; J.H. Phillips, 1892 to 1923. Of course, there have been several later clerks of the church, ending with Fred Lockwood, who is serving at the present time. The first pastor was the Rev. Peter C. Hoge, who served the congregation from 1858 to 1876. Greatly beloved by the church, this devout man was instrumental in leading many to Christ. He was a preacher of real power. As we look down the roll of those baptized under his ministry, we find the names of James Brainard Kent, John Kent, John Branham, Anderson Branham, James H. Sadler, J.C. Jones, James Hughes, Adam Harrison, Jane Sadler, Hugh Sadler, and scores of others whose influence was felt in this community. Mr. Hoge baptized the only two members of this church who went directly from the membership of the church into the ministry, namely Rodzi Sadler and William Joseph Sadler. It was Mr. Hoge, who baptized Anne Kent, later Mrs. William Trainham of Richmond from whose home went out a minister, Rev. C. Wirt Trainham. From that same Richmond home went out a missionary to China, Mrs. R.E. Chambers. The minutes of the church during the early years show a more strict interpretation of proper behavior than is made now. Many recalcitrant members were banned from the church for such improprieties as dancing or following pleasurable activities on the Sabbath, later to be reinstated on repentance and promises of better behavior. In 1901, the old church gave way to the present white frame building, or rather the central part of it. This new building (shown at left), dedicated in 1902 during the pastorate of the Rev. George F. Cook, was built with J.E. Sadler as chief carpenter. Morton J. Sadler donated the glash transom over the door. The two wings built to house Sunday school rooms were added between 1910 and 1911. Additional Sunday school rooms were built to the rear of the church in 1964. Antioch went on a "full time" basis in 1963 with the Rev. John be. Mann Sr., becoming the first "full time" pastor. At this time, the church has completed a modern parsonage.